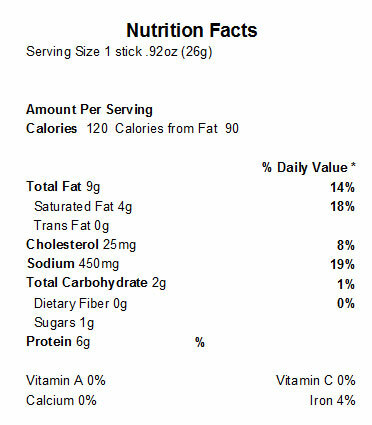 • Each Original Beef Stick is 0.92 oz. There are 200 Original Beef Sticks in each Case. Each Case is divided into four 50-Count carrying totes. 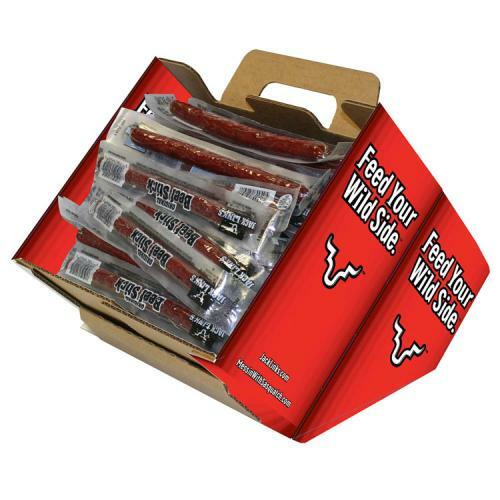 Sell each Original Beef Stick for $1.50 to make $150.00 profit off each case. BEEF, SALT, CORN SYRUP, SPICES, CONTAINS 2% OR LESS OF WATER, DEXTROSE, SUGAR, FLAVORINGS, SODIUM ERYTHORBATE, LACTIC ACID STARTER CULTURE, SODIUM NITRITE, BHA, BHT, CITRIC ACID. TREATED WITH A SOLUTION OF POTASSIUM SORBATE TO ENSURE FRESHNESS. BHA, BHT, & CITRIC ACID ADDED TO HELP PROTECT FLAVOR.